There's a neat little trick with Google Gmail that allows you to make unlimited free phone calls via the Internet. And if you have an iPhone, iPad or iPod touch, you can make calls through its Google Hangouts app. You read that right – you can make free data-based (VoIP) phone calls on any Apple iOS device. 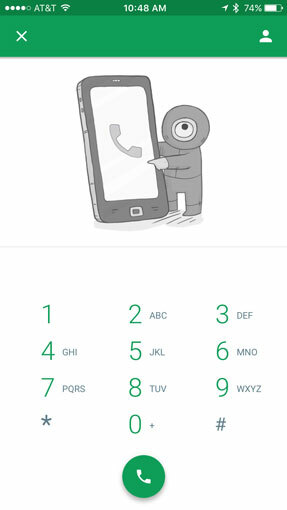 Making a call with the newly updated Google Hangouts app couldn’t be easier. Just open the app, sign in to it with your existing Google account ID and then tap the telephone icon in the top right hand corner of the screen. A phone keypad will then display so you can complete your call. And yes, you can use Hangouts to make calls to actual phones – the person you’re calling doesn’t need to be running a Google app or even own a cellphone. Because Google Hangout calls are placed via a data connection, they make a great way to keep making phone calls even when you’re up against your monthly minutes allowance. It’s also a good way to make call to and receive calls from people you don’t want having your “real” cell number, like a blind first date. And of course, any old iPod touch or iPad you have laying around the house can instantly become a second WiFi-powered cellphone. The updated free Google Hangouts app is currently available for iOS devices via the Apple App Store. There’s no cost to make calls in the U.S. or Canada via the Google Hangouts app; international rates may vary. For more on the service, visit google.com/hangouts. So I had a quick question, are you still able to receive calls even if you DON’T have a free Google Voice phone number with hangouts? Say I called someone and left a message, if they called me back, would it still show up as a Google hangouts notification? For audio calling and conferencing, one can use apps like R-HUB web conferencing servers. It provides free HD VOIP audio conferencing.